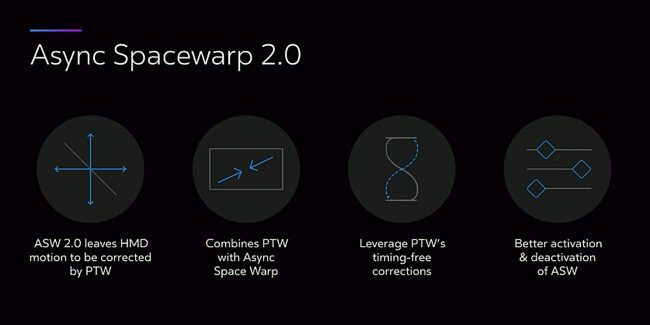 Oculus has announced the release of Asynchronous Spacewarp 2.0 for the Oculus Rift, which is a major upgrade over the previous version designed to provide vastly improved visuals inside the headset without dropped frame-rates or judder through the use of frame-smoothing techniques and the lowest possible latency for a comfortable VR experience. The new ASW 2.0 update is capable of significantly improving the overall performance of a virtual reality experience resulting in far fewer motion estimation artifacts in a VR scene thanks to the combined use of both Oculus’ Positional Timewarp (PTW), which reduces latency, and ‘Spacewarp’, which takes the strain off the user’s PC hardware by reducing the game/applications framerate to 45fps and inserting a synthetic frame to fill the gaps in cases where the game/application is not able to render a new frame in time in order to still display a smooth 90fps to the Rift headset. It’s worth noting that developers will need to provide the necessary depth information to take advantage of the new ASW 2.0 functionality, however, as Oculus points out, “most Rift apps on the Oculus Store built on Unreal Engine 4 and Unity already provide the depth information required to make ASW 2.0 work.” If the depth data for an application is not provided, then it will simply revert back to ASW 1.0 until the developer patches the app to activate ASW 2.0.